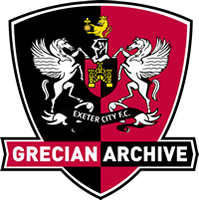 On signing the player, Exeter City manager Jack English described Little as a defender who relies on correctness of method and shrewd positioning, rather than dash. After playing for North East clubs, Leeholme Juniors, Sheldon Athletic and Crook Town, Little signed for Newcastle United in 1927, going on to make three league appearances for the Magpies. He then signed for Southport in 1928, where he had a very successful time, featuring in 160 Third Division North fixtures for the Sandgrounders. Moving on to Chester in 1933, he added another 60 league outings to his name, before linking up with French club, Le Havre. He was back in the Football League though for the 1935-36 season, playing for Northampton Town, scoring one goal in 57 league matches. Moving to Exeter City, he made his debut in a disastrous 5-0 defeat at Queens Park Rangers in the second game of the 1938-39 season. However, he still played a number of games at left-back, including a run of eleven consecutive appearances at the end of the season. After just one season at St James’ Park, he returned to play for Southport in a second spell at the club, and later wore the colours of Fleetwood Hesketh and then High Park. John Little died in 1988.